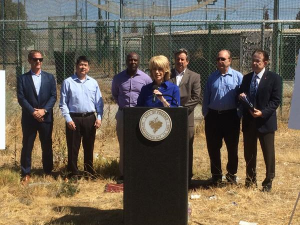 FRESNO, CA (KMJ) – A Fresno developer is asking for more money to run Granite Park. 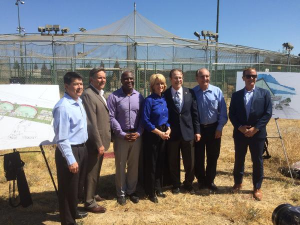 In 2016, under Mayor Ashley Swearengin, the City of Fresno announced a 25-year lease agreement with developer Terrance Frazier (above, 3rd from left) and TJ Cox, under their non-profit Central Valley Community Sports Foundation. In exchange for $2.7 million dollars in improvements and refurbishments, the City would give Frazier $150,000 to run the park. 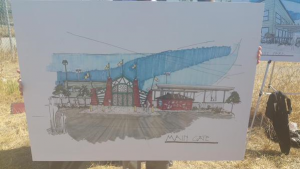 The non-profit was to bear the costs for a cleaning up the three ball fields, adding new basketball and volleyball courts, walking and jogging paths, a restaurant with patio and viewing area on the 20 acre site. Now, two years later, Frazier, calling in to KMJ’s Chris Daniel’s Show, said its not enough, he’s losing up to $20,000 dollars a month. “Right now, it’s very difficult to run a park and make money, look, I’m not – I never went into it – I went into it to get the park to break even, it’s nowhere close to breaking even,” Fraizer told Chris Daniel. Frazier’s asking for another $150,000 dollars in addition to the $150,000 the City of Fresno is already providing for maintenance fees.